Adherence to the “Do not call” list ( DNCL ). No exemptions for collection calls, political parties, charities or newspaper subscriptions. If a person doesn’t want calls they should not receive calls. Currently the CRTC maintains a number of exemptions for the DNCL and these should be eliminated. Meaningful Caller ID. Most of the time these calls display a Caller ID number that is not returnable. This makes validation of the call impossible, hence the Elections Canada fraud. 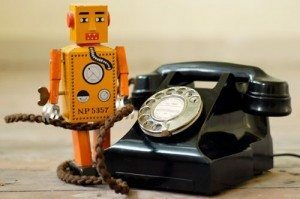 No Robocalls should be allowed to originate from a blocked number. The banks have learned from this with their credit card transaction validation process. All calls originate with a Caller ID number that you can call back to validate that it’s actually the real bank calling you. Automated Opt-Out feature. All Robocalls should allow a user to hit *<some number> to opt-out of future calls. This will prevent a lot of issues with wrong numbers in the database. The banks have also adapted in this area with credit card validation calls allowing a user to press a key combination to speak with a live person if required. Reference number in the message. Each automated call should include a reference number that the calling party can verify and determine which number was called, and if a service provider is being used which company/organization originated the number. When I was receiving my collection call spam, the collections company kept insisting my number was not in their database. It wasn’t, but some other 416 number was forwarded to my cell phone number. Eventually the had to manually dial numbers dialed during the hour my calls were received to track the problem. This would have be easily resolved if a call reference number was included in the recording. I hope the Robocall scandal finally sees some improvements in the CRTC regulations. Unfortunately, many robocalls don’t even originate in Canada. The phone system doesn’t actually validate the CID information. It comes from the originating side of the call and can be made to be anything. It would probably be almost impossible to enforce valid CID data. The CRTC could create a rule, but the phone companies would put up a fight, as it would add expensive complexity to their networks for no added revenue. Previous Previous post: Rogers One… Just not the one.